Hello again Pretty Providence readers! This is Shonee here again from Hawthorne and Main. I am super excited to be with you today. I love me some good shelves! 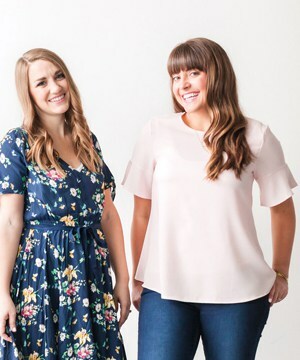 They are so fun to customize and style. 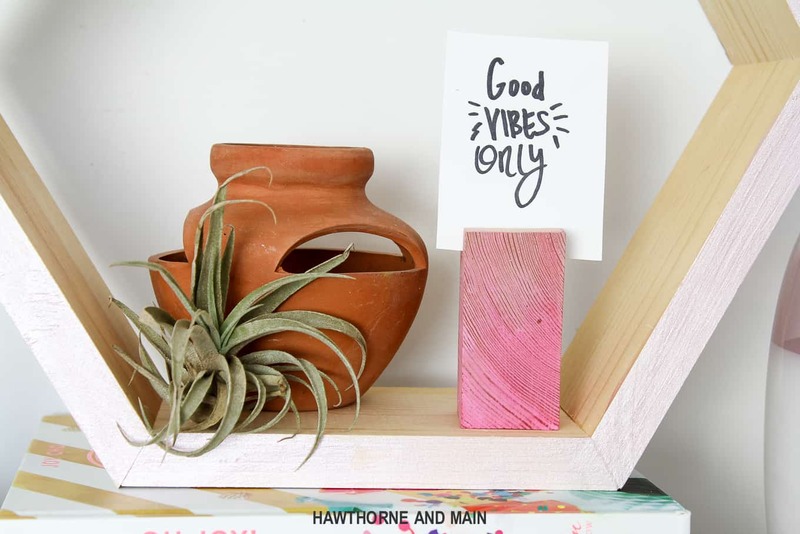 There is even a popular hashtag on Instagram called #shelfie where you can find some great shelf styling ideas. 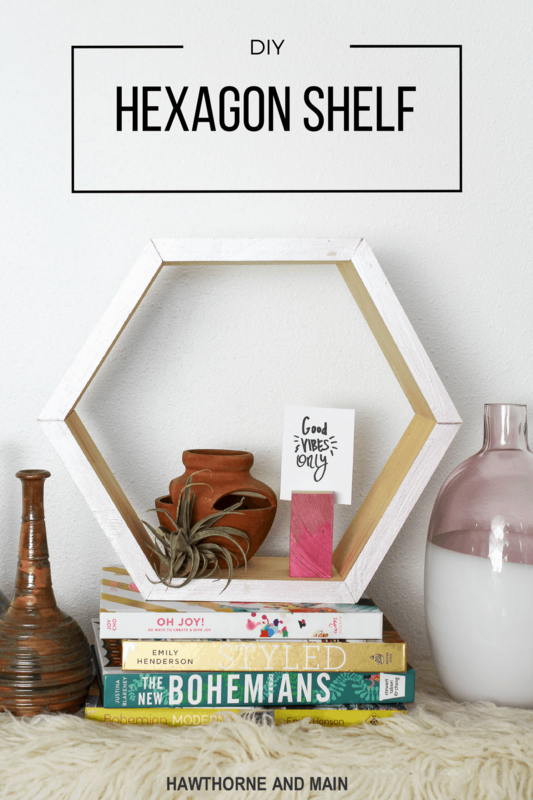 Today I am going to show you how easy it is to create this DIY hexagon shelf. These would be good hung on a wall or even sitting on a desk or other flat surface. Set the angle on your miter saw to 30 degrees. This will be the only angle needed for this shelf. It is very important that the angle be precise. This is to ensure that all the angles match up when you start to assemble to shelf. You will need 6 pieces cut for each shelf. 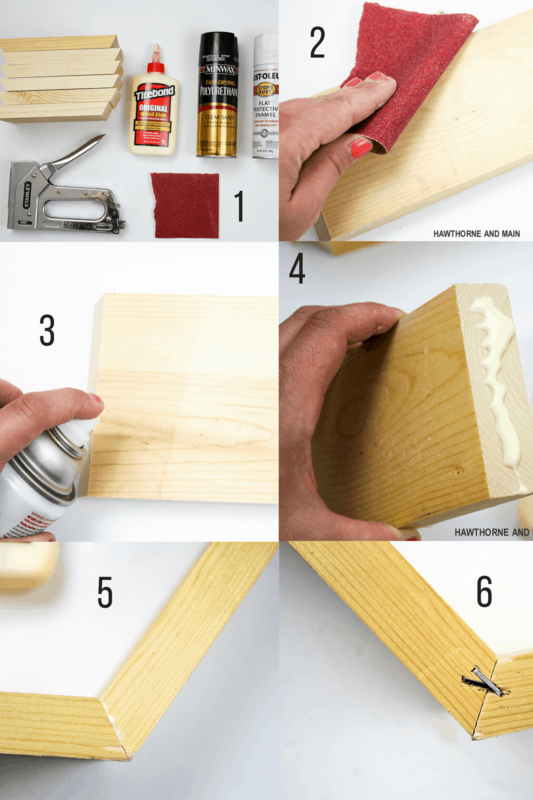 After all the pieces are cut, use some sandpaper to get them smooth. Pick your favorite paint and paint all the pieces. I ended up doing a spray paint on the outside and then I added some acrylic blush metallic paint to just the front of the shelf. 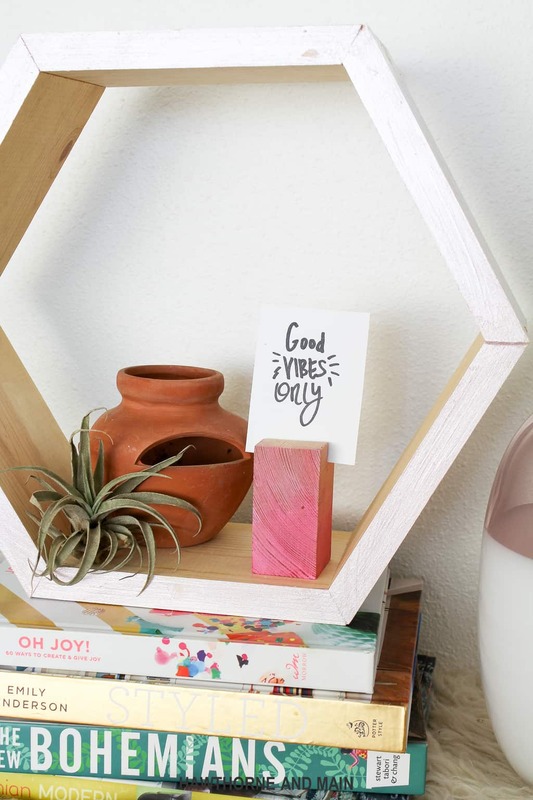 You can really customize and get creative here. I found that it was more effective to glue the entire shelf together first before moving to the stapling. Maybe if you had another pair of hands to hold the two boards in place while you stapled, might make it easier. Either way, make sure that you have glue on all the joints. After the glue is on add staples. I ended up doing two in a criss cross pattern. I also experimented with using a finish nail gun which seemed to work better. The staples did work but I felt that the nail gun would make the shelves stronger and more durable. I also on added the staples to the back of the shelf. Overall I am really happy with how this shelf came together. 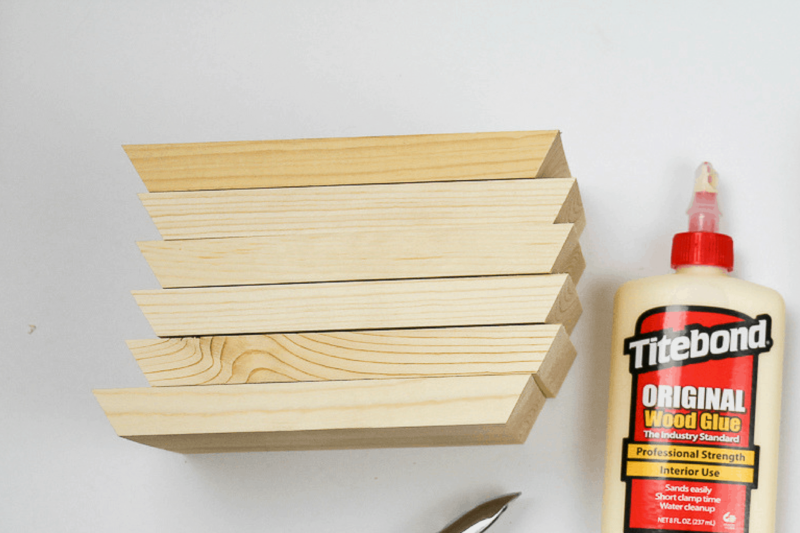 Keep in mind you can cut different widths and lengths of lumber to make different sizes of shelves. Just make sure that you use the 30 degree angle for all cuts. 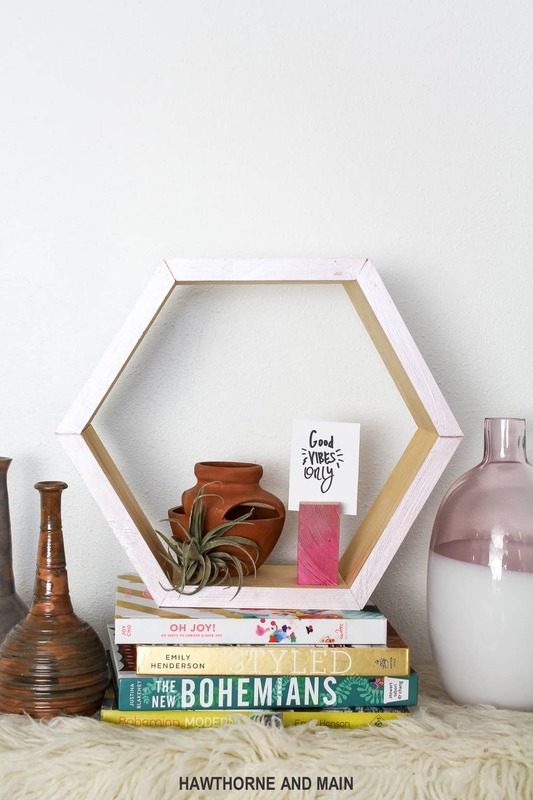 Where would you put hexagon shelves?